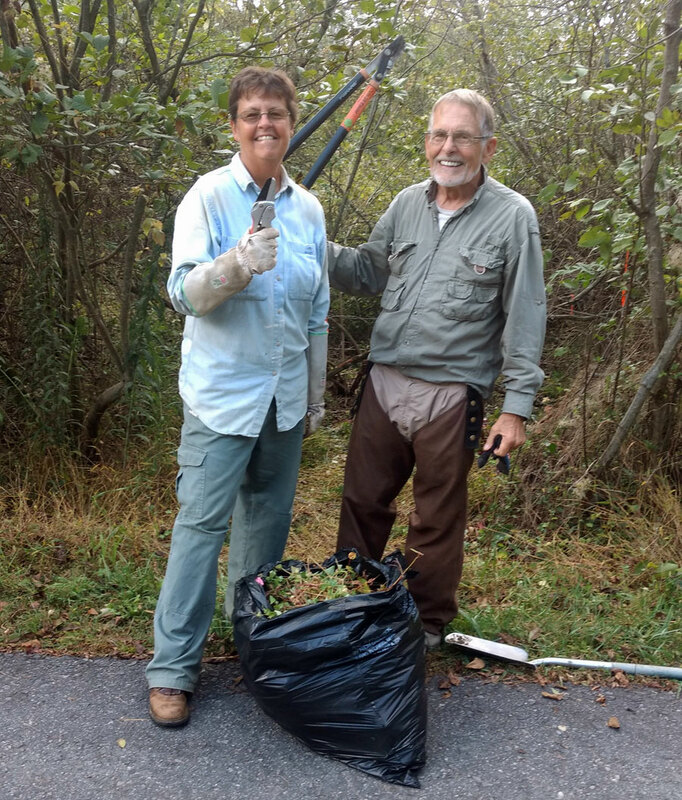 Thank you to our volunteers who quickly sprung into action removing the invasive Mile-A-Minute Weed (Persicaria perfoliata) along the Greenway Trail in Boone! 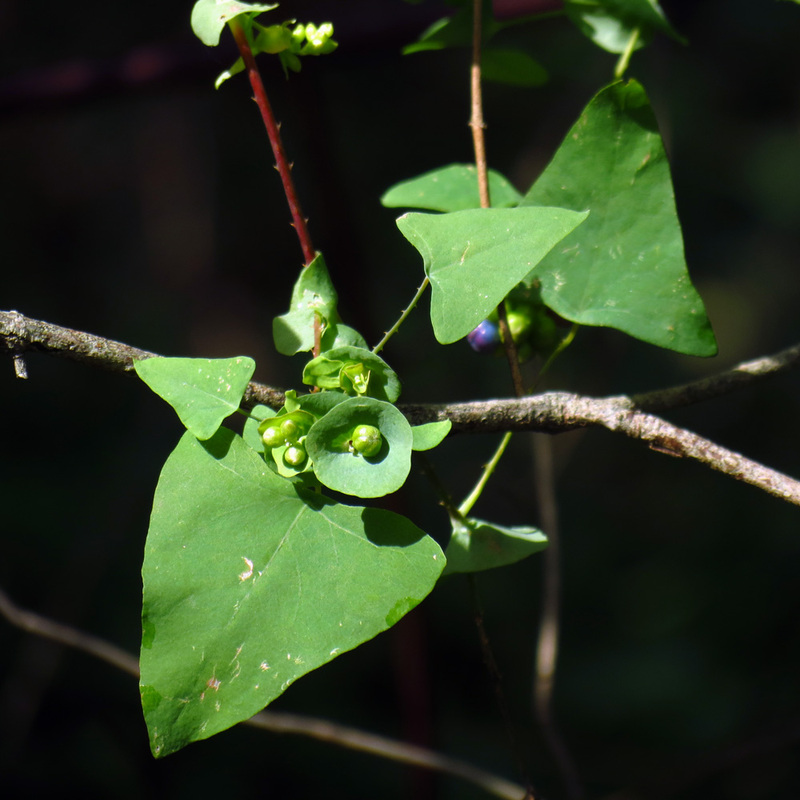 This plant is also known as Asiatic Tearthumb and under the synonym Polygonum perfoliatum. 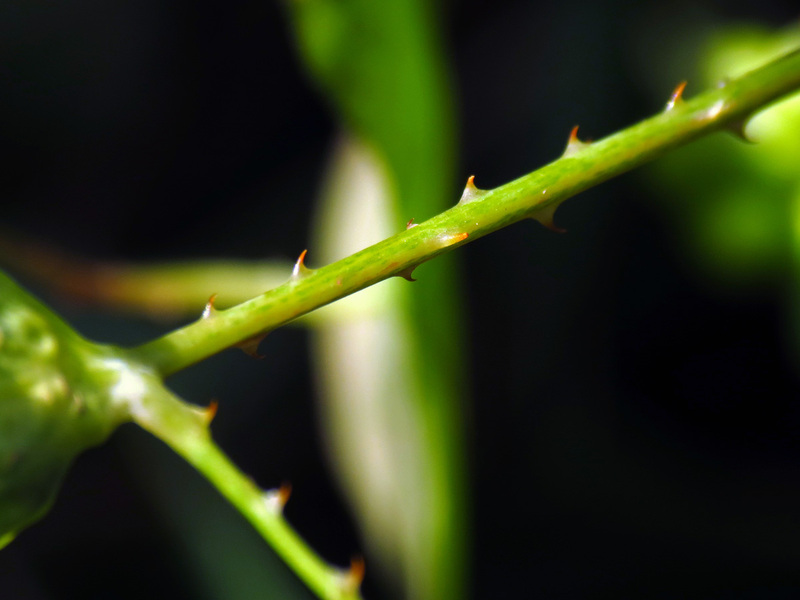 It is listed as a class A noxious weed in North Carolina. If you see it growing anywhere in the wild, you should report it so action can be taken to control it. Our chapter chair Mark Rose met with Debbie and Jim Shetterly to tear out this patch and collect the fruits. It turned out there were just three plants rooted to the ground; probably just one bird dropping with seeds that started it. 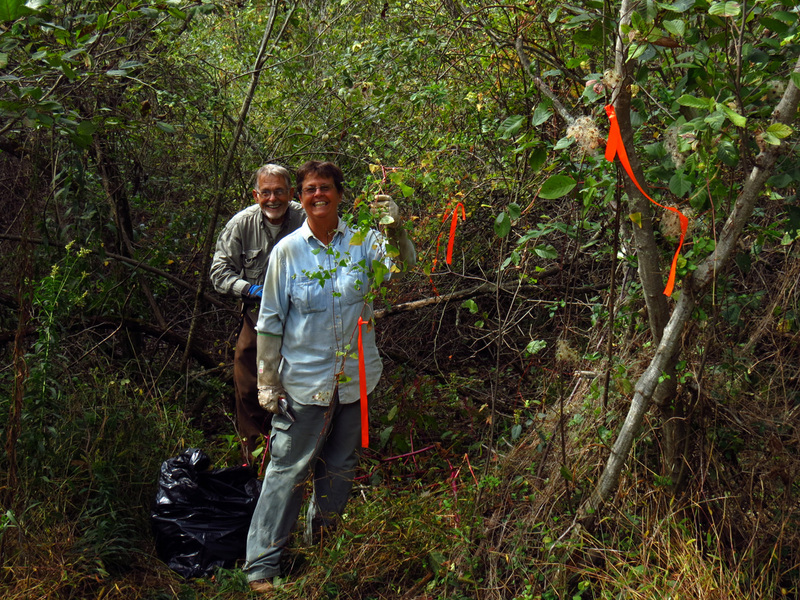 Orange flags mark the site where the invasive plants were spotted along the Town of Boone Greenway Trail. Our volunteers hard at work pulling out the Mile-A-Minute Vine. Thank you to our fearless volunteers Debbie and Jimmy tackling this mess! One distinguishing characteristic of Mile-A-Minute Weed is the triangular shape of the leaves and the circular leafy cups around the stem. 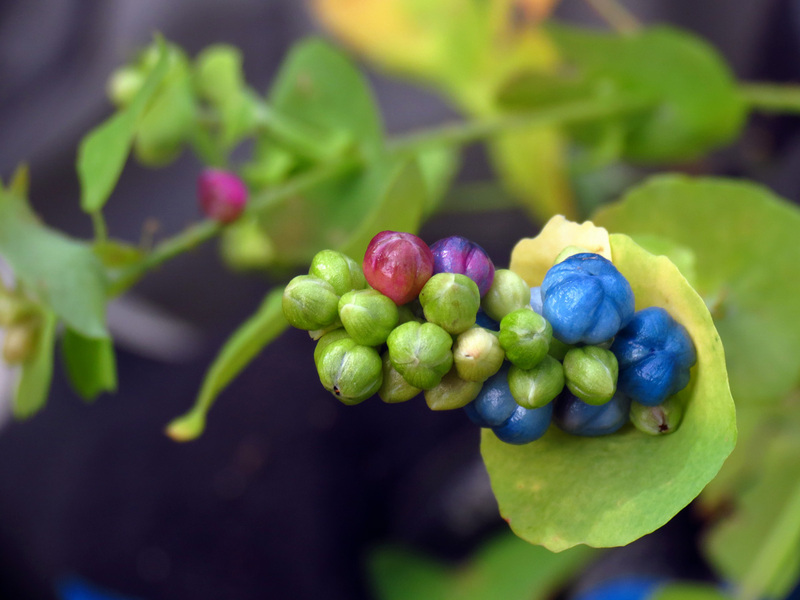 The berries of this plant are actually very pretty, but they are of course the source of trouble as they are picked up by birds to spread the seeds. 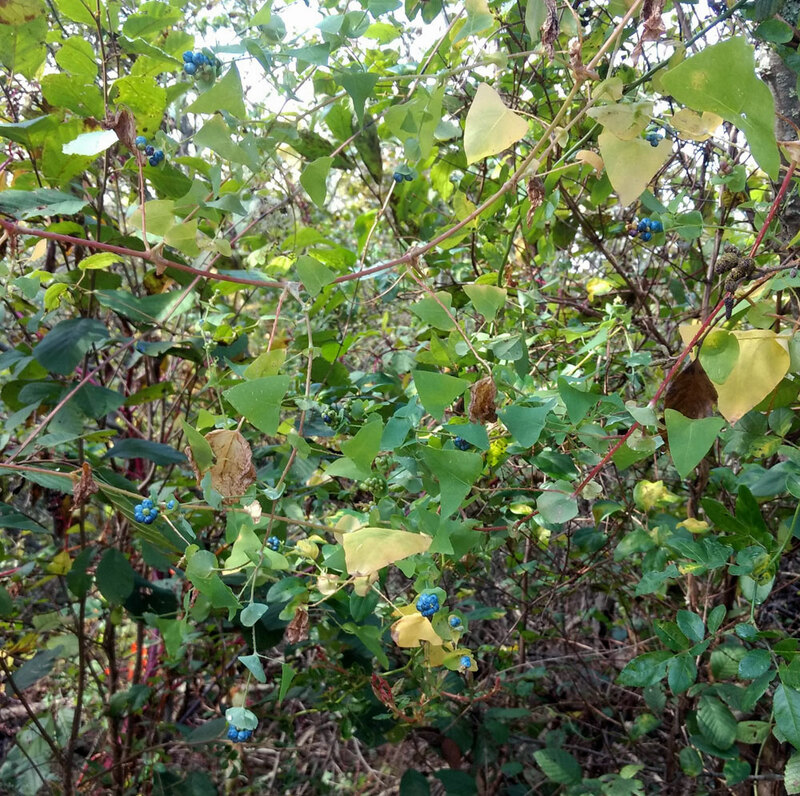 These plants are annuals, so one of the control strategies is to not let it go to fruit or remove and destroy any fruits and seeds before they can be spread. The vines (and actually the entire plant) are covered in some nasty barbs, so definitely wear sturdy gloves if you plan on handling it. A picture of an entire patch of Mile-A-Minute Vine. 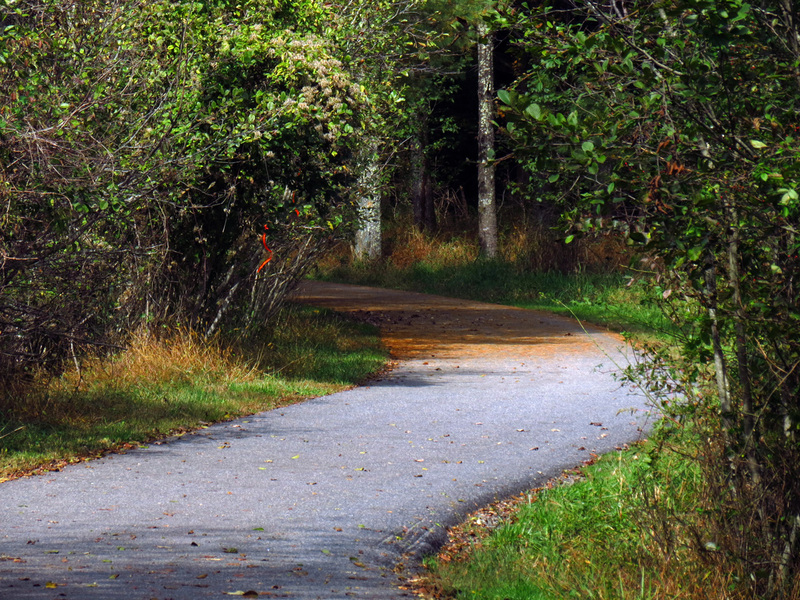 If you see these plants coming back along the Greenway Trail, please let us know. The earlier in the season we can get it out, the likelier it is that we can eradicate it. Big thanks to Debbie, Jimmy and Mark for fighting the alien invaders! All the Mile-A-Minute Weed was removed - for now. They will likely be growing back from seeds that dropped and were missed during the cleanup, so please help us be on the lookout for their return! We will need to keep an eye on this location to make sure it doesn’t grow back and spread. 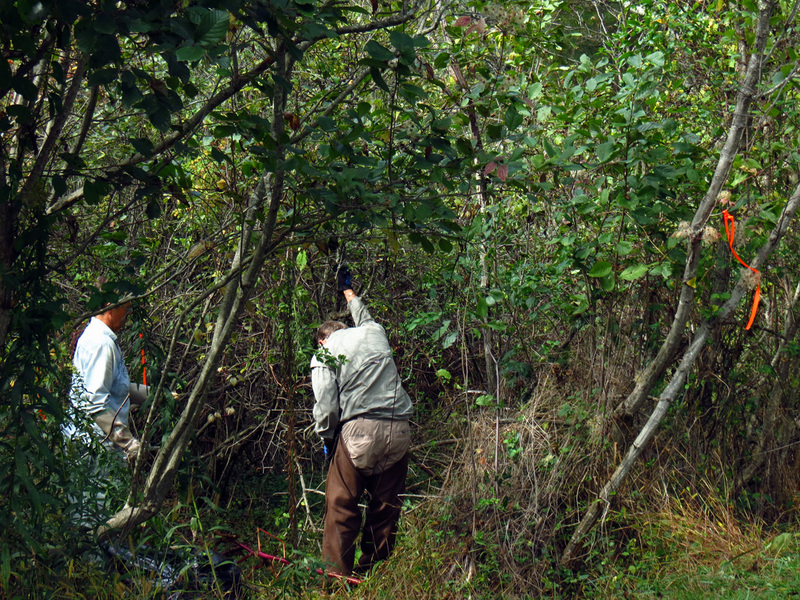 Please let us know at blueridgencnps@yahoo.com if you would like to join our invasive weed task force!